TLDR - Part 4: Component filtering BLAZING fast with macros! Made a huge optimization in the way Seagal filters list of entities that contains specific components! Using the macro I’ve written two days ago as a base I now use bitflags instead of multiple for-loops and several Std.is(classA, classB). I now just use simple bit-flag comparison as the macro auto-generates a unique bitflag for each component class, and the result is stunning! I actually had to go back to my old test and change the number of entities from 10,000 to 100,000!!! The optimized code! 0.012 seconds! Thats 391% faster!!! Note 1: Both test 2 and test 3 took 0.001 seconds when running 10,000 entities. That’s why I had to increase the number of entities. Note 2: Test 2 now takes only 0.007 seconds with that huge amount of entities! When reading up on the Edge-entity system in the post about TLDR I got an idea on how to speed up my Seagal enging a lot using macros. The problem is that macros is a subject with few tutorials and resources online, and it seems a lot of people are afraid to look into it. I will try to explain what macros are, some good places to start learning more, and a cool example that I’ll expand upon to improve the speed of Seagal! I’ve downloaded and tried a new exciting ECS-framework called Edge. The interesting thing about it is that it relies heavily on haxe macros to generate code at compile time that will remove of the costly runtime type checking. I did a similar test to test number 3 in my TLDR - Part 2. Only the third test was interesting to me. And look! It’s taking between 4 and 5 milliseconds here as well! That was surprising, I really though you had to try hard to be slower than my current implementation. However, using macros seems super interesting. and I just got an idea on how I could use macros in seagal that might speed the matching up quite a bit! Last day on my shader week. Not sure what to do when a friend of mine suggested that I do a “wobbly water shader”. Well, I guess you could do it pretty simple by using a displacement map as in day 2, so I used another approach manipulating the vertexes with a sine-wave instead. 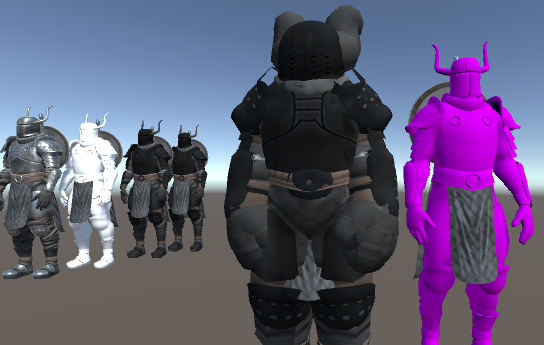 This tutorial starts with an overview, and then goes on to surface shaders. I decided to start from the beginning, but did not manage to complete the surface-part in just one hour. The Vertex/Fragment-part comes afterwards and is the part I’m looking forward to. 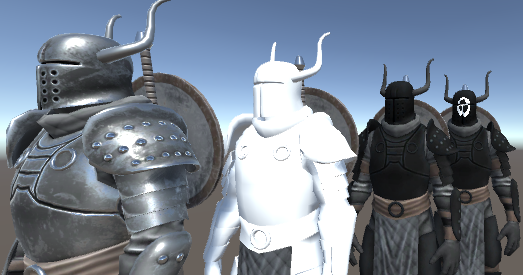 Knight number 2 is a surface shader that only sets the albedo property (base color). Knight number 4 uses the built-in worldPos input variable to paint a circle - based on distance from a point in world space. I have collected a number of interesting resources for starting to get acquainted with writing shaders in Unity, so I have decided to devote an hour a day this week to start going through them (I think I can manage an hour a day, but not sure… I’m currently on parental leave with my two 11-months twin girls. I’ll do as best as I can). After this first hour I’ve gone through the first Shader101 in the top link. Simple stuff. Drawing colors and/or a texture to a quad. With and without transperancy. However, the tutorial lacked depth. And I spent the rest of the hour trying to find out more about the sampler2D-class used to sample pixels from the texture to the quad. Without luck. Starting designing my little game engine, I decided I wanted it to run on top of my existing ECS (Entity-Component-System) I made a few years back called Seagal. However - after started drawing a bit of system design on a piece of paper it became clear that I would require a HUGE deal of entities, components and component fetching. Looking at the code it became obvious that it was written for developer comfort and not the amount of speed that was required. But that was just my gut feeling. What is better? Data! * the tests are run on a windows build in release-mode. * on my stationary computer with an i5-4670 CPU @ 3.40 GHz, Win8. So bootstraping the whole system, and adding the 10.000 entities with its components took 2 milliseconds. Not all to interesting, we will probably not add so many components during a game session. Rather during start-up. My second test was to ask the system for an array of TestComponent1’s, disregarding which entity they belonged to. It took 2 ms for 10.000 entities. First I query a list of all entities that has both TestComponent1 AND TestComponent2 (in this test suite that means all of them). Then I iterate through all entities, requesting a reference to TestComponent1 and after that another reference to TestComponent2. I was surprised to see the third test be only 4ms. I know I have a ton of possible improvements I can make. The look-up is not very efficient, and I do not cache the result so any subsequent calls would redo all that work even though nothing has changed. Before I can go on I want to see if I can speed my ECS framework even more. Meaning that the next couple of posts will be about Seagal before continuing with TLDR! So, I’m currently on parental leave for 6 months. I hadn’t planned on doing any programming. I thought taking care of two twin girls 10 months old would take 100% of my energy, but I figured I get an hour here and there every now and then that I could devote to some programming. TLDR stands for Tommys Ludum Dare Resources… or something. Not quite sure yet. 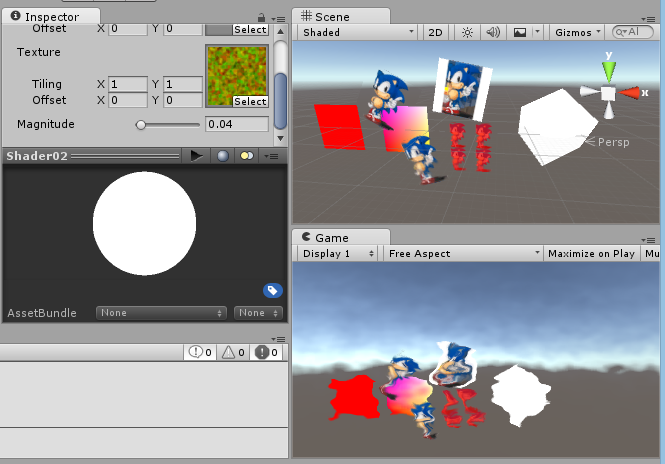 It’s going to be a 2d game engine built in haxe, on top of openFL and my previously built entity framework Seagal. A small engine, that I can leverage on when doing game jams such as Ludum Dare. And I’ll be starting from scratch. Here is a list of some things I figure would be nice to have in the engine. I might add or remove stuff as time passes. I don’t want it to be tile based. I want everything to be freely placed and rotatable. For that I need to write some fancy collision system. Both broad and narrow phase. Need to work a lot on making this debuggable. A lot of places where stuff can go wrong. In-game level editor will be needed. Wow, that’s a lot. I think I’ll stop there for now. We’ll see how this turns out. Today I’ll start on setting the project up.